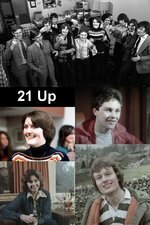 3rd in the series of Michael Apted's "Up Series" documentaries, this episode tracks our more mature and insightful protagonists as they enter adulthood, exploring both their lives and their thoughts about the two earlier films. Lynn is married and running a bookmobile, Simon works as a meatpacker, Sue seems happy as a travel agent, Paul the same as a bricklayer, Bruce studies advanced math and calls himself a Socialist, wealthy Suzy smokes and seems quite world-weary, Charles (making his last appearance) waxes philosophic, no-longer-so-shy Nick studies physics at Oxford, Neil squats in poverty, Peter lives in a dump with college roommates and taxi driver Tony and posh John argue about who came off worst in the earlier films. Spoilers for the entire series allowed as we continue weekly every 7 years to 56 Up. This 2012 Telegraph interview includes info about the haphazard process Apted used to choose the original participants, and how he learned not to play god with Tony at 21. This New Yorker piece discusses Apted's evolution from ideologically driven and "unbearably patronizing" to a more nuanced perspective. This piece from Dissent is a good overview of the series' class issues. I love that Tony and John seem to chat so much at the party. Did they have a real connection, or was that the producers' work? This is my first time through the series, and I was planning to avoid spoilers. But I was so worried about Neil that I immediately came to the internet looking for reassurances that he's okay. I feel like this is one of the best in the entire series. The kids are grown up but definitely NOT their fully-formed adult selves. The interview with Suzy is astonishing (especially when you know how it all turns out). Poor Neil's long, hard journey begins in earnest. The posh boys were assholes even when they were little kids, and never really changed all that much. If all you ever saw were the first film and this one (and maybe 42 Up thrown in for good measure, just so you can get them all as complete adults), it would be fine. I'm pretty sure Nick was totally stoned in his 21 year interview.